Publisher: Watts & Co. for Rationalist Press Association. Country: U.K. Date: c. 1903-21. 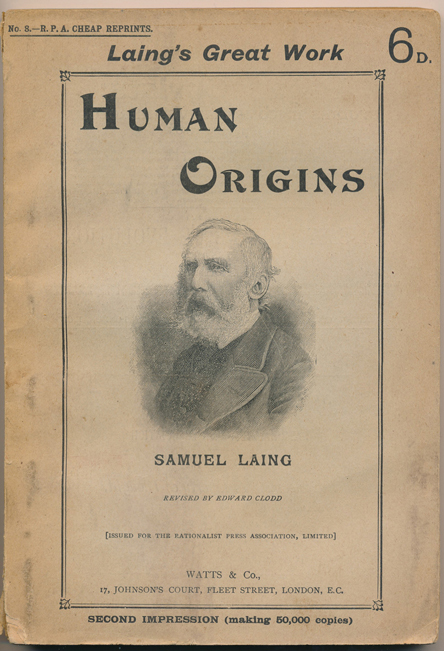 Human Origins by Samuel Laing. London, Watts & Co. (for Rationalist Press Association), 1903. (R.P.A. Cheap Reprints, No. 8). Series Note: This series, which was published by Watts & Co., of 17 Johnson's Court, Fleet Street, London, E.C., included titles by scientists, philosophers, literary authors, rationalists and humanists of the 19th and early 20th century. The series reprinted cheap paperback versions of formerly much more expensive books, mostly in hardcover, and aimed to be affordable for a mass audience of white and blue workers of modest means. 1. Huxley's Lectures and Essays: A Selection. With Autobiographical Sketch. 9. The Service of Man (by J. Cotter Morison) (With "In Memoriam" Introduction by Frederic Harrison. 10. Tyndall's Lectures and Essays: A Selection. With Autobiographical Sketch of the Author. The above list appeared in Human Origins (by Samuel Laing). (R. P. A. Cheap Reprints series.) London, Watts and Co., 1903.